Growing a new life is one of the highest honors ever bestowed upon me. And it’s hard work. Ain’t gonna lie. During this special time, it’s important for me to nourish my body, and aside from a healthy diet, exercise, and efforts at relaxation; another important way I care for myself and my growing being is with herbs. Not all herbs are safe for pregnancy, and herbs during the childbearing year may be right for some, but not for others. It’s important to be mindful of this when walking your herbal journey. 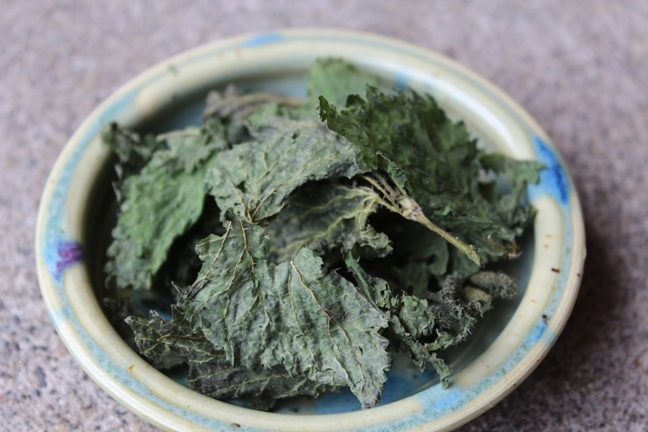 For me, I focus mainly on three herbs; nettle, red raspberry leaf and oatstraw, and drink daily herbal infusions of them. 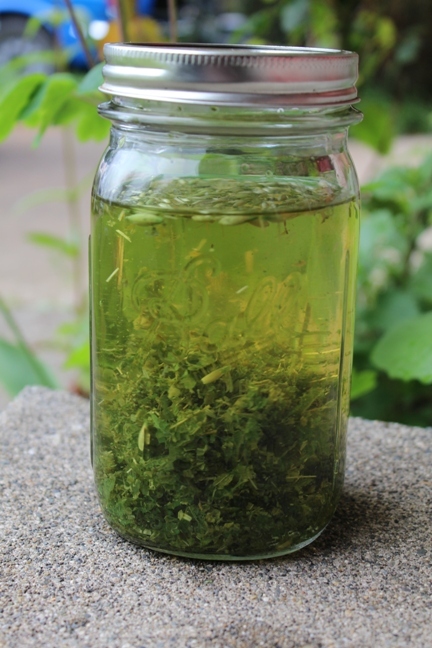 An infusion is a large amount of herb brewed for a long time. 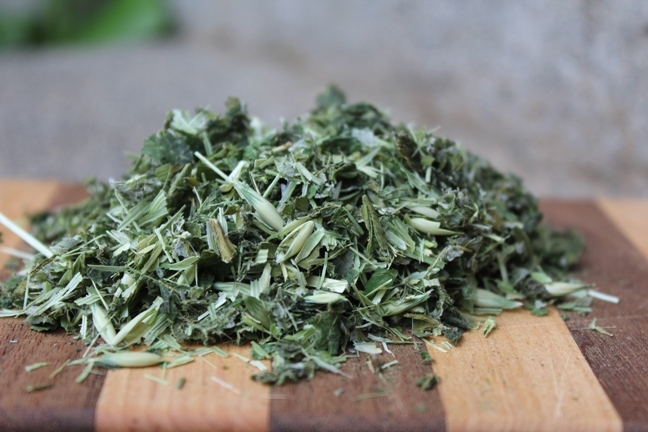 Typically, one ounce by weight (about a cup by volume) of dried herb is placed in a quart jar which is then filled to the top with boiling water, tightly lidded and allowed to steep for 4-10 hours. After straining, a cup or more is consumed, and the remainder chilled to slow spoilage. Drinking 2-4 cups a day is usual. Since the minerals and other phytochemicals in nourishing herbs are made more accessible by drying, dried herbs are considered best for infusions. …when you drink nourishing herbal infusions, you don’t need to take any supplements. Vitamin Retailer Magazine reports that the average American spends $100 a month on supplements; health conscious folk spend 3-12 times that much. If you buy dried infusion herb wholesale, you will spend less than $1 to make a quart of infusion using a full ounce by weight of dried herb. That’s $1 a day for optimum nourishment, nourishment that needs no digestion, nourishment that is absorbed directly into the blood and into the cells, nourishment that is loaded with chi, nourishment that nourishes the Earth, too, not the corporations and factories that make pills and supplements. ~ Preventing miscarriage and hemorrhage. Raspberry leaf tones the uterus and helps prevent miscarriage and postpartum hemorrhage from a relaxed or atonic uterus. ~ Easing of morning sickness. Many attest to raspberry leaves’ gentle relief of nausea and stomach distress throughout pregnancy. ~ Reducing pain during labor and after birth. By toning the muscles used during labor and delivery, Raspberry leaf eliminates many of the reasons for a painful delivery and prolonged recovery. It does not, however, counter the pain of pelvic dilation. ~ Assisting in the production of plentiful breast milk. The high mineral content of Raspberry leaf assist in milk production, but its astringency may counter that for some women. ~ Providing a safe and speedy pariuntion. 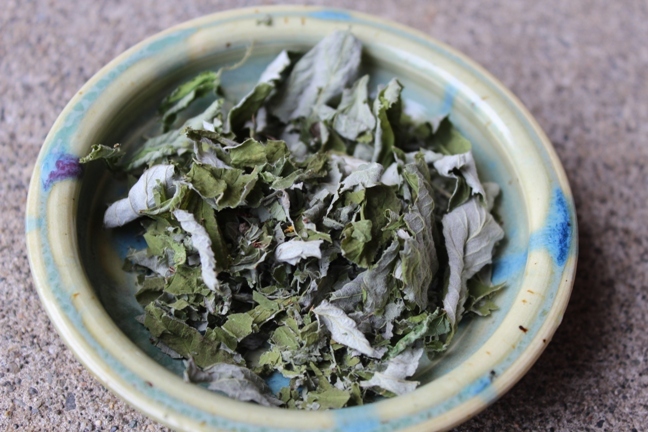 Raspberry leaf works to encourage the uterus to let go and function without tension. It does not strengthen contractions, but does allow the contracting uterus to work more effectively and so may make the birth easier and faster. So, uh, where do I sign up… Right!? 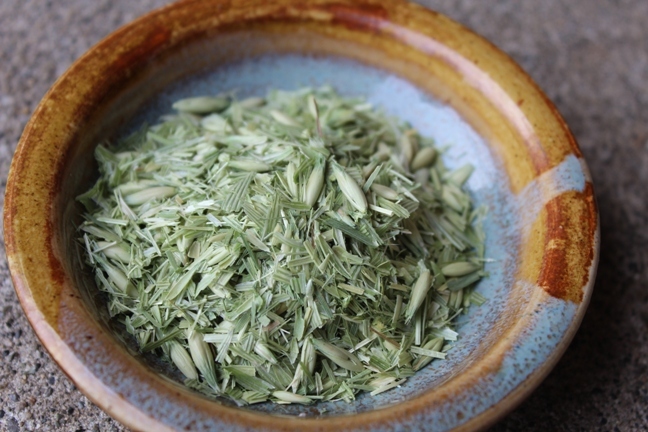 A delightful little herb with an impressive resume, oatstraw is a nervine–‘nourisher to the nerves’ and many sing the praises of oatstraw’s cooling, calming ways. Oatstraw contains vitamin B (complex) along with copper, magnesium, calcium, iron, zinc and silica. Oatstraw’s high vitamin B content can aid in producing a more restful sleep, and can help to balance feelings of stress and anxiety. Sometimes complimented by chamomile and lemonbalm, but not necessitated by, oatstraw can make a gentle, yet amazingly effective soother. Naturally anxious, I highly value the work that oatstraw does for my body, especially during the childbearing year! In reality, I grab equal-sized large pinches of nettle, red raspberry leaf and oatstraw, and pour boiling water over the top. For highest potency, I leave my gathered herbs intact whenever I can, and crush them between my fingertips just before using. In the photo above, I chopped them all to make it pretty for you. Aren’t I nice? 🙂 I throw my herbs into a quart-sized mason and pour boiling water atop. I often do this before bed and drink it the next day. I also have been known to make an infusion any ‘ol time, and aim to be patient for as many hours as I can before drinking it. Lastly, I make a regular ‘ol tea and chug on. Infusions make awesome chilled teas! Take care to note that infusions are most beneficial and effective when used regularly–5 times per week, but still have slight benefits and nourishment when taken sporadically. I understand that gathering isn’t always possible and when my supply dwindles, I order from Mountain Rose Herbs because I appreciate their philosophies and sustainable practices. I know I’m always getting a high quality at an affordable price.